Not for nothing is CSK a serial winner in the IPL. In this edition, the rollicking side already has one foot in the play-offs after its seventh win. Superb catchCSK’s catching in the outfield was outstanding. The vibrant du Plessis held four; a sprinting, diving forward catch at long-off to dismiss Robin Uthappa being sensational. Then Suresh Raina held centre-stage during the chase even as the KKR bowlers made inroads. When Piyush Chawla pitched short, he cut. When the leg-spinner gave more air, he stepped down to loft the ball straight for a six. The southpaw pulled, flicked, ran hard and built partnerships during his match-winner unbeaten 58. 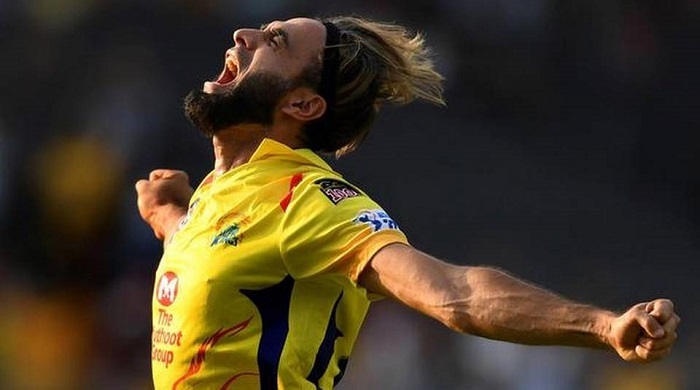 The unbroken 41-run sixth-wicket association in 24 deliveries between two the two left-handers, Raina and a rampant Ravindra Jadeja [the latter scored 31 of those], took CSK past the line with two deliveries remaining. The final onslaught was perfectly timed after Chawla, mixing his googlies with leg-spin and top-spinners, had prised out Ambati Rayudu and Kedar Jadhav and M.S. Dhoni played around a delivery turning into him from the parsimonious Sunil Narine. The duel between Tahir and the big-hitting Andre Russell was exhilarating. Getting the powerful West Indies to mistime a delivery spinning away from him represented CSK’s best chance of dismissing Russell early. Russell loves to hit the ball between long-on and mid-wicket but to accomplish this against Tahir’s leg-spin, he had to hit against the turn. The West Indian backed himself to strike the ball over long on for the maximum, hitting against turn. The wily Tahir had laid a trap. The next ball was quicker and a wee bit shorter and had a little more bounce even as it spun away from Russell. The West Indian went for the on-side blow again, the ball struck the top portion of the bat and substitute Dhruv Shorey flung himself forward to hold a terrific catch at long-on. Shardul Thakur caught the eye with his skiddy pace, control and yorkers.The heavy hitting Lynn (82) impressed with his incredible bat-speed. He employs his willow like a sledge-hammer, bludgeons the ball. Lynn’s straight hitting and back-foot play — whether hooking or creasing room for inside-out strokes — was exhilarating. Chris Lynn c Thakur b Tahir 82 (51b, 7x4, 6x6), Sunil Narine c du Plessis b Santner 2 (7b), Nitish Rana c du Plessis b Tahir 21 (24b, 3x4), Robin Uthappa c du Plessis b Tahir 0 (1b), Dinesh Karthik c du Plessis b Thakur 18 (14b, 2x4), Andre Russell c sub b Tahir 10 (4b, 1x4, 1x6), Shubman Gill c Jadeja b Thakur 15 (20b), Piyush Chawla (not out) 4 (5b), Kuldeep Yadav run out 0 (0b); Extras (b-1, w-8): 9; Total (for eight wkts. in 20 overs): 161. 1-38 (Narine, 4.5 overs), 2-79 (Rana, 10.2), 3-80 (Uthappa, 10.4), 4-122 (Lynn, 14.1), 5-132 (Russell, 14.5), 6-150 (Karthik, 17.2), 7-161 (Gill, 19.5), 8-161 (Kuldeep, 19.6). Chahar 4-0-36-0, Thakur 4-0-18-2, Santner 4-0-30-1, Jadeja 4-0-49-0, Tahir 4-0-27-4. Shane Watson lbw b Gurney 6 (7b, 1x4), Faf du Plessis b Narine 24 (16b, 5x4), Suresh Raina (not out) 58 (42b, 7x4, 1x6), Ambati Rayudu c Uthappa b Chawla 5 (11b), Kedar Jadhav lbw Chawla 20 (12b, 3x4. 1x6), M.S. Dhoni lbw Narine 16 (13b, 1x6), Ravindra Jadeja (not out) 31 (17b, 5x4); Extras (w-2): 2; Total (for five wkts. in 19.4 overs): 162. 1-29 (Watson, 3.1), 2-44 (du Plessis, 5.3), 3-61 (Rayudu, 9.1), 4-81 (Jadhav, 11.1), 5-121 (Dhoni, 15.4). Prasidh Krishna 4-0-30-0, Gurney 4-0-37-1, Russell 1-0-16-0, Narine 4-1-19-2, Kuldeep 3-0-28-0, Chawla 3.4-0-32-2. CSK won by five wkts. with two balls remaining.